Type: Lithium-Ion. Voltage: 3.7V (max 4.2V).Capacity: 650 mAh. Height: 76.5 mm. Diameter: 14 mm. Price: £7.98. £7.50 each if you buy two or more. Postage and packing included. Termination: Very popular 510 (M7 x 0.5) internal thread and eGo (M12 x 0.5) external thread. Replaces: eGo batteries, eGo-T batteries. Compatible with CE4/CE5/H2. The cylindrical eGo-T Lithium-Ion battery is an increasingly popular size of lithium-ion cells for e-cigarettes. Our eGo-T battery is made from stainless steel with an elegant brushed steel matt finish. The lithium-ion technology used in these cylindrical eGo-T batteries is light-weight and high voltage and has no 'memory-effect'. The 650mAh capacity should give you at least 600 puffs and probably as many as 750 puffs. It will charge from empty in about two hours. This e-Go-T Uniross e-cigarette battery feature a 5 click on/ 1 click off lock so you don't accidentally switch on your e-cigarette battery. The on/off switch is an LED that also acts as a state-of-charge indicator. The colour changes depending on the battery's state of charge. White means it's between 50% to 100% charged, blue means it's between 5% to 50% and red means it's under 5% charged and needs to be connected to a charger right away. 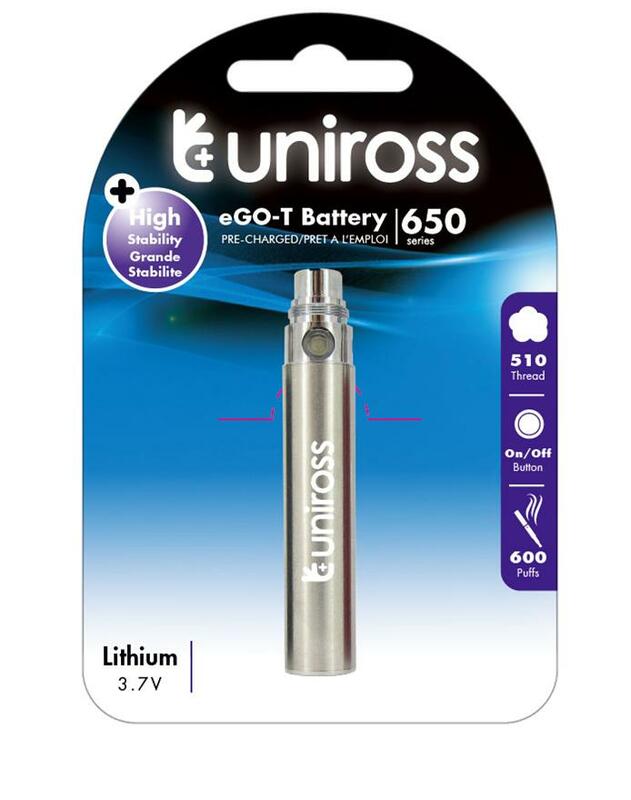 This Uniross e-Go-T battery is a branded product from a well-known battery manufacturer and, reassuringly, comes with CE mark. Uniross products products are always tested and certified and made from the highest quality components.